When it comes to getting your home Holiday Ready, one area you should pay attention to is the guest bathroom. For the first time ever I have a guest bathroom. We still use it on a daily basis ourselves, but it’s a half bath on the lower level. For years before that our guest bathroom was also our kids’ bathroom, which meant it was near impossible to keep clean. So for those of you who are dealing with that predicament, I completely understand how hard it can be to have a bathroom that’s guest ready. 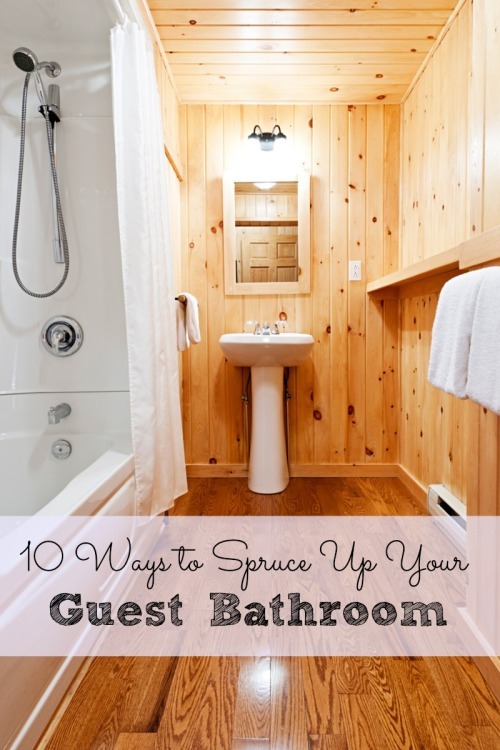 But no matter what kind of set up you currently have, these 10 ways to spruce up your guest bathroom can work for you. 1. 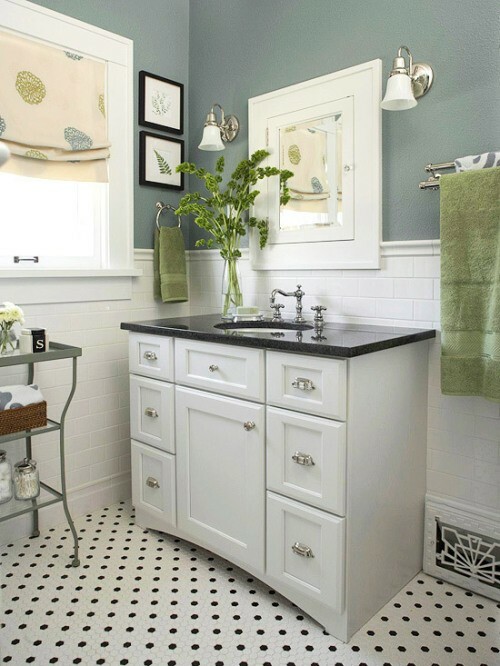 Clear the Clutter – If it doesn’t belong in the bathroom, get rid of it. If it’s a broken bath toy, get rid of it. If it drives you crazy every time you walk into the bathroom, get rid of it! Since the bathroom is a room in the house that needs to be cleaned and wiped down a few times a week, clutter can not only make that extremely hard, but it can create an unhealthy situation for you. 2. 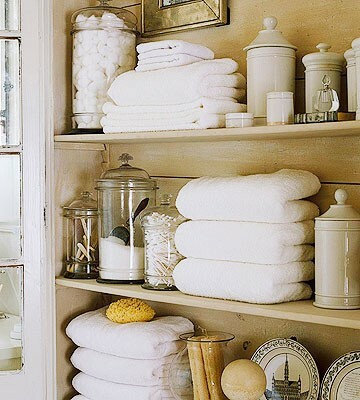 If you can’t get rid of it, hide it – There are some things that have to be stored in the bathroom or they’re there because you have no other option. For example, toilet paper, bath toys and medicines. 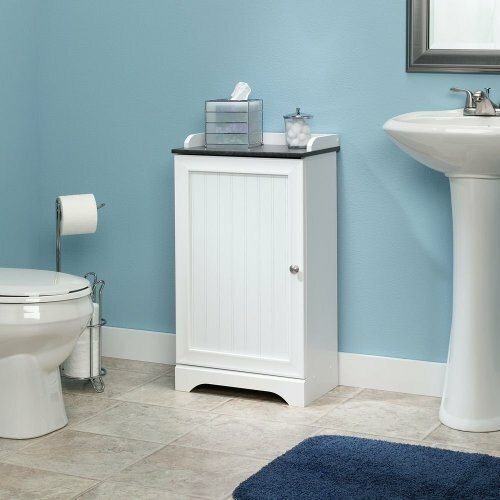 If the bathroom is the only place you can store extra toilet paper, hide it in a cabinet, basket or large decorative storage box. 3. Give your bathroom a good scrub from top to bottom – When is the last time you’ve given your bathroom a really good cleaning? Remove everything from the counter, toilet top, shower and floors and scrub away. Wipe down everything with a cleaner. Sweep and mop the floors. Scrub the tub and fixtures. 4. Change or rinse the shower liner – Have you checked your shower liner lately? There’s a possibility it needs to be changed or cleaned. If it smells bad or has mildew growing on it, then it definitely needs to be taken care of. This can be causing your bathroom to smell and mildew is never a good thing. If it’s a heavier duty shower liner, washing it with laundry detergent, vinegar or bleach might do the trick and save you from purchasing a new one. But some liners are super cheap and are made to be replaced. I recommend a mildew resistant liner. 5. Change out the hand towels – If your hand towels are ragged, stained or just plain old, changing them out with new ones can make all the difference in the appearance of your guest bathroom. 6. Store extra towels/wash cloths in a basket or on a shelf where they’re visible to guests – If your guests are staying over night, have extra clean towels available to them where they are easy to see. There’s something so inviting about a basket of folded up white towels. It makes you feel like you’re at a nice hotel and it shows your guests that you care. 7. 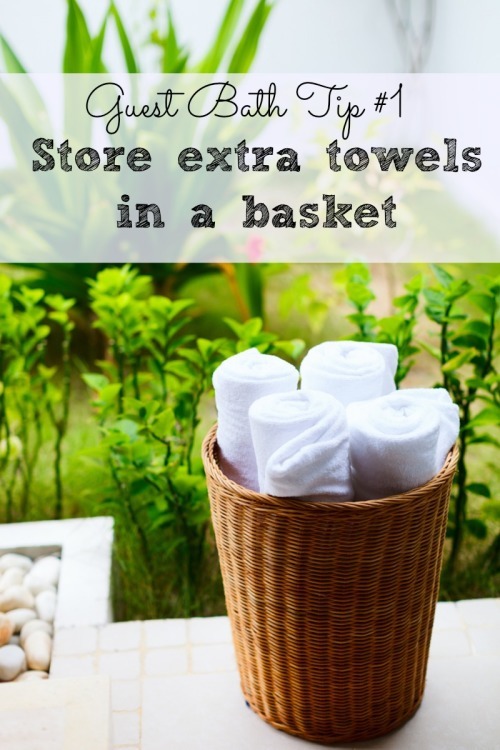 Have extra toiletries on hand – Have you ever been on a trip and forgot your toothbrush? Yep. Me too. The worst part is discovering it as you’re getting ready for bed. Having extra toiletries on hand like tootbrushes, toothpaste, shampoo, conditioner and deodorant can be a life-saver for your guests. 8. Add some art work – Are the walls of your guest bathroom bare or have mismatched wall hangings? By adding just a couple of pieces of cheery art work to the space, you can completely change the look. 9. Bring in some greenery – If your counter space allows, add a plant or fresh flowers to the space. Plants and flowers liven up a space and make them feel calming. It’s special touches like this that really make a difference. 10. Try aromatherapy – Candles are great in theory, but they can be dangerous if forgotten about and also not practical around younger guests. An oil diffuser is not only safer, it also leaves your bathroom smelling great. I hope these guest bathroom ideas will help you get your home ready for those Holiday guests!